Dedication of the widely acclaimed new Sports Complex at Sandwich High School is set for 6:00 to 7:00 p.m., Friday, October 23rd, and the public is invited to attend. 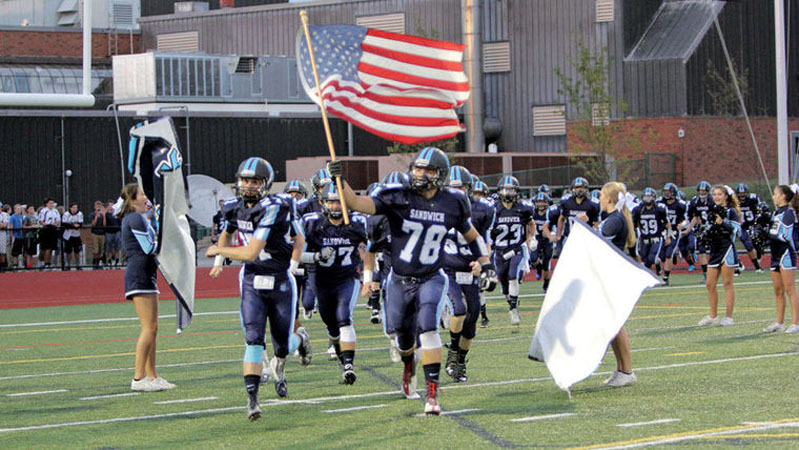 Following the dedication, the Sandwich High Blue Knights football team with take the field against the 2014 state champion Marshfield Rams — playing on the new artificial turf field under new high-intensity lights. The Captain Gerald F. DeConto USN Veterans Memorial Stadium is designed to provide seating for an expected capacity crowd. 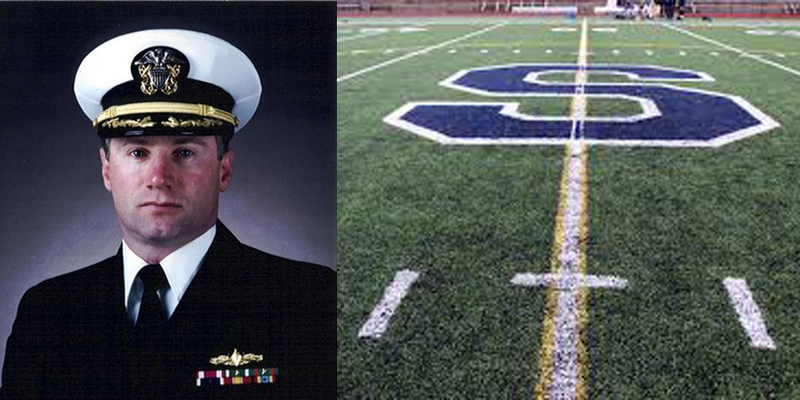 Captain DeConto, a star athlete at Sandwich High, died on duty in the Pentagon in the 9/11 attack. The family donated $525,000 that ignited public/private support for this beautiful stadium. Ceremonies will feature remarks by state and town leaders and school officials, followed by presentation of the Complex to the Sandwich School Committee, project Chairman David DeConto announced. He is Jerry’s older brother and also a graduate of Sandwich High School. The anchor of the Complex is the 1,500-seat DeConto Stadium, complete with press box and scoreboard. The Complex includes a state-of-the art track and field area and a synthetic grass turf field for football, soccer, lacrosse, and other sports. as well as highly illuminating light poles for night use, and visitors’ seating. Concession now operating out of temporary structures, will soon be housed in a permanent building. A field house with athletes’ locker-rooms and public restrooms is planned for the future. The facilities will rank favorably with the best of other high schools on Cape Cod. A walkway leads from public parking up to a Veterans Memorial Circle adjacent to the Complex. The Memorial Circle is dedicated to not only Veterans but also includes special messages from friends and family. These remembrances will be marked by bricks that form the walkway and circle. In the circle center is a Navy-style flagpole flying the American flag at the peak, the U.S. Naval Academy and MIA flags on the yardarms, and the Town of Sandwich flag on the ensign or gaff. Benches will eventually line the outer rim of the circle. “The DeConto Stadium and the Sports Complex constitute the largest public project Sandwich has undertaken in many years,” Chairman DeConto said. “This handoff to the School Committee adds a splendid new, state-of-the art Stadium and Sports Complex worth more than $3.0 million to our Town properties, with a combination of public and private donations. Some work remains, DeConto said. A field house with locker and shower facilities for athletes, rather than the facilities inside the high school now being used, will be an important addition, he said.. Indoor restrooms for the public are planned, he added. A Direct Appropriation fund to ensure continued upkeep of the Sports Complex has been discussed and would be highly desirable, DeConto said. SHS Football had their season opener and first game in the new stadium on September 11th this year. You can read the Sandwich Enterprise article here.